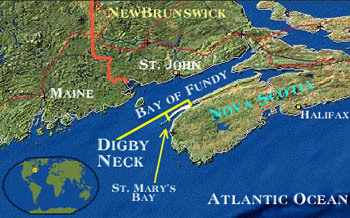 Cradled between the Bay of Fundy and St. Mary's Bay, Digby Neck exhibits some of the highest tides in the world. Incredibly diverse landscapes blend basalt ridges, valleys, salt marshes, bays, inlets, beaches and coastlines into a rich mosaic. Time and tradition combine here to offer us a compelling view of life lived on and by the sea. Use the buttons at the bottom of your browser window to navigate this site. The logo at the top left of each page will bring you back home.